Summergirl was first introduced to Lau Heong Seafood Restaurant蒥香海鲜饭店at Sentul, KL by her colleagues when they brought her there for lunch one day. Food is delicious, and price is surprisingly reasonable. 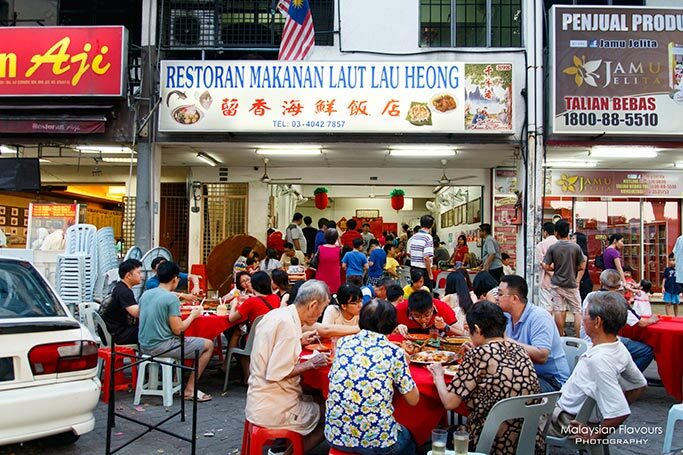 Housed within a row of old and shabby shophouses, surrounded by condominiums, Lau Heong is definitely one of the hidden gems in the bustling Kuala Lumpur city. The restaurant is separated into two floors, where the lower floor is hot and stuffy in the afternoon time, so it is recommended to go upstairs, which is air-conditioned, in case you are here for lunch. But pray for your luck to get a table during peak hours. As evening falls, foldable tables and plastic chairs will be stretched out by the roadside to accommodate groups after groups of customers that flock here for dinner. We were there one Sunday evening for dinner. It was 6PM but the restaurant was full house. Very crowded. Parking space is limited but you can always head to the back of the shoplots, where Lau Heong Seafood Restaurant is sincere enough to keep a row of parking space for their customers. Lau Heong Seafood Restaurant is a family run restaurant, serving Dai Chao-style food that covers common Chinese delicacies such as Sweet & Sour Pork, Tofu on Hotplate, Wine Chicken, Steamed Egg, etc.. Among the popular, highly-recommended dishes are Crispy German Pork Knuckle, Prawns & Squid on Hotplate, Belacan Deep Fried Chicken and Fish Head Curry. 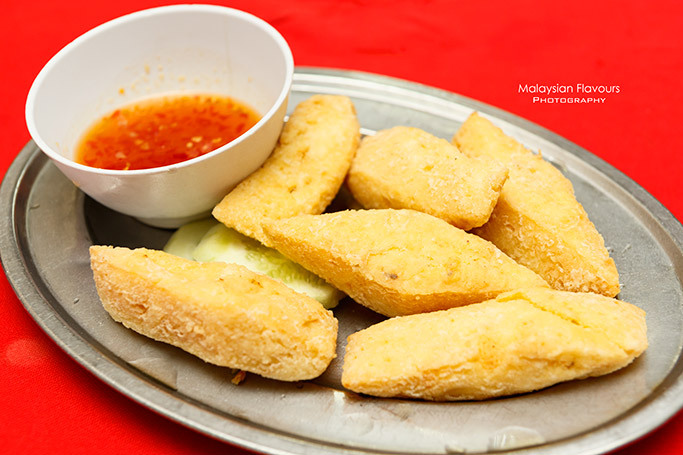 Arrived in 6 pieces, these homemade tofu have minced meat-texture, moist and firm, jacketed with crispy, golden brown deep-fried layer. Addictive but rather one-dimensional in taste, dip them into the sauce served along for a sweet and spicy twist. In Lau Heong Seafood Restaurant, almost every table has one plate of this dish. 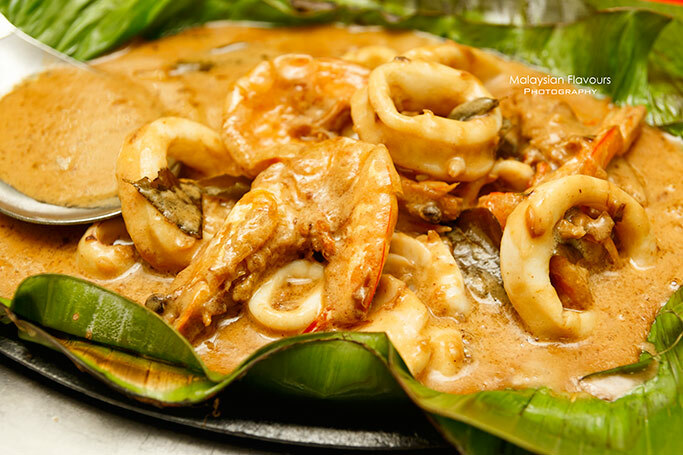 Not sure how we should name this dish, but as long as you mention: “squid/prawn, or a mixed of both on hotplate”, the staffs will understand your order. Despite the “no-name”, we have to agree it deserves as the restaurant’s signature dish, the crowd favourite . The sauce itself is a clear winner- creamy and salty, very subtle in spiciness with a touch of herbs & spices. Douse the gravy in your rice and get them instantly flavoured up. Yes, the gravy is the limelight, as the squid and prawns weren’t memorable at all. Not exactly fresh, and the squid was a tad rubbery, hard to chew. 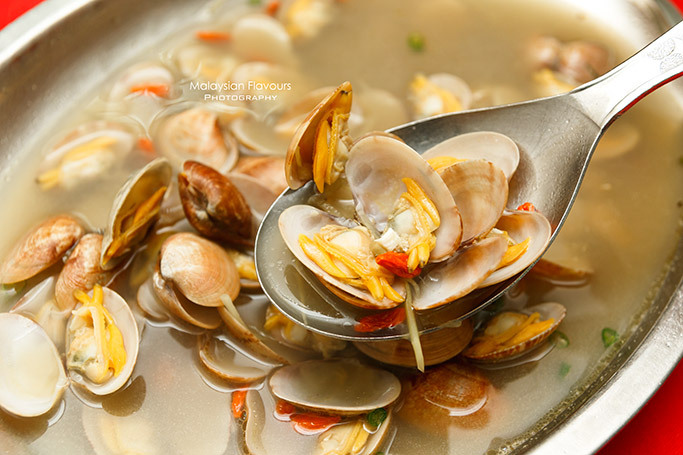 Generous amount of lala drenched in a bed of superior soup that delivered pronounced flavours of Chinese wine and a faint hint of herbs aroma from Gozi berries, but lack of umami sweetness from the sea. A little too pale for our personal tastebud, but you may love it. 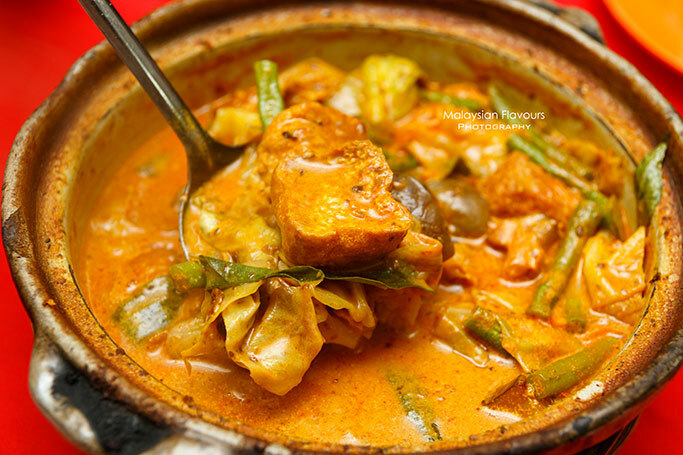 Since we were not into Fish Head Curry which is another signature in Lau Heong, we opted for Vegetable Curry instead. Wasn’t towards our liking, as it is overwhelmed with the taste of curry powder, could barely reached for a balance within curry and coconut milk. By the time we got our receipt, we got stunned that the curry cost us whopping price of RM18.00. A huge plate of lala was priced at RM18.00, and they charged us the same for curry with just vegetables? In short, Lau Heong is a decent place for Dai Chao. But quality wise, it is inconsistent, probably due to the crowd. Recommended? Of course. Stay for their Belacan Chicken and Squid on Hotplate. Vegetable claypot curries are around this price outside, even at stir fry stalls about RM15. Nothing to shout about.